Finding an apartment you can actually afford on your starving writer/subway musician/hopeful post-grad income is an overwhelming and challenging process. And, in theory, this is precisely why you need a real estate agent to help you navigate the market (or, more generally, not lose your mind). But even that can be a surprisingly difficult experience -- NYC brokers have long been stereotyped as seedy (finagling larger fees, lying about available properties, writing shoeboxes off as “charming” and “quaint”), which is why we asked a handful of real estate industry experts to spill the clandestine knowledge many brokers keep under wraps. In fact, if you meet certain criteria, there’s arguably no reason to use a broker at all. According to Triplemint agent Josh Heyer, if you have previously rented in New York, have a deep knowledge of New York City neighborhoods, and have unlimited time to search, you should save at least one month’s rent by finding an apartment without a middleman. That being said, if any of those factors are off, it’s a good idea to enlist the help of an expert. A well-connected real estate agent should also be able to find you at least a few exclusive listings. “A good broker should know management companies in your target neighborhood that don’t actively advertise to the public,” Heyer says. Lee notes that a standard fee might be 15% of a year’s rent, but if an apartment has been sitting on the market for even a few weeks, you can look at paying 10-12% -- or as little as one month’s rent. Most likely, the broker fee isn’t just going to go away completely -- after all, real estate agents rely on commission for income. But it’s possible to get the landlord or property manager to shoulder the fee. Ask your broker to propose this concession during negotiations. You know them: the pleasant-sounding yet excruciatingly vague descriptors brokers use to describe apartments that are deeply flawed. 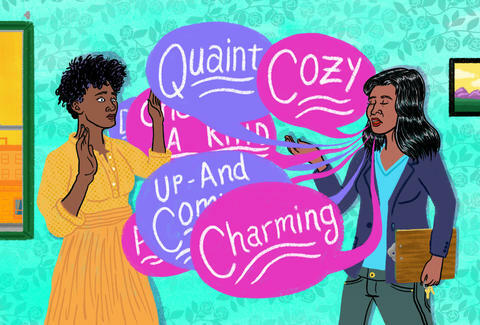 Lee explains that “quaint” means “dated,” while any combination of the words “quiet, peaceful, or serene” probably suggests your apartment is dark and facing a brick wall. And Gans warns about the words “charming” and “one-of-a-kind” -- which probably mean it’s a totally bizarre space with a bathroom in the middle of the living room and a skylight that looks directly into the top apartment’s kitchen. If an apartment sounds too good to be true, chances are it probably is. It’s not uncommon to hear an agent say, “you can easily add a wall to create a bedroom,” or open up a space by “creating a half-wall.” What they won’t tell you, according to one anonymous real estate agent, is that while a project like that might seem relatively affordable in terms of materials and labor, it’s actually way more involved and can easily cost you more than $10,000. “You need to hire an architect to submit plans to the [Department of Buildings],” the agent explains -- which makes all those studios agents try to sell as one-bedrooms way less appealing. It’s increasingly common for renters to get concessions on an apartment, like reduced rent. If you know how to negotiate with a landlord or property manager, you might be surprised how many incentives an owner will offer to get a vacant space filled. Still, it can help to have an expert on your side. Heyer says agents know the “possible push points” that can help you catch a break. Perhaps this property manager has a history of giving free parking, one month free, or waiving a security deposit -- something an ordinary New Yorker might not know. Your real estate broker is going to have access to information about recent rentals -- and what concessions landlords and property managers have made on comparable units. There are plenty of ways a broker can conveniently conceal information about an apartment. For instance, “Some unscrupulous brokers won’t tell you if an apartment gets a lot of street noise at night,” says Triplemint’s content manager Sarah Linney. If you’re not 100% familiar with the neighborhood (or the specific block), do your due diligence. Maybe the apartment building is on top of a bar that’s open until 4am, or there’s non-stop construction in the lot across the street. Perhaps that nondescript building around the corner is a firehouse. Whenever possible, chat with other tenants and find out more about the actual living situation. Just how quickly does the on-site super gets things repaired? Does the neighborhood get rowdy on the weekends? Will wailing sirens keep you up all night long? These are details that -- even if your broker knows them -- he or she might hesitate to share. If there’s more than one unit in a building up for grabs, ask the broker to see them all. One anonymous agent recalls a building where some of the units looked just-refinished, while others were clearly leaking from a rainstorm. If you get a call saying you’ve been approved, but for a different unit that’s “the same,” don’t agree without seeing the place first. Lazy brokers who want to make the quickest deal possible might just show one unit -- or continue to show the best-looking unit even when it’s no longer available. Melanie Taryn Lieberman is a New York-based writer who suggests first-time renters should pick a realtor they actually like spending time with. Because you’ll be spending a lot of time with that person.